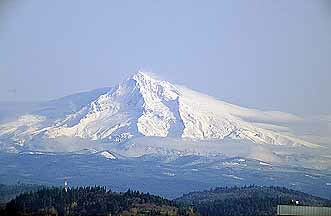 Mount Hood National Forest covers the northern extent of the Cascades in Oregon, featuring the well-known summit of Mount Hood itself. It contains historic features such as Timberline Lodge and the Multnomah Falls Lodge. Recreation includes camping, hiking, river running, and alpine skiing. Wildlife viewing is popular with many species present.